Published by: TidBITS Publishing Inc. I have been a Mac user for quite a few years now. It was surprising that I had never used iChat, considering how often I am talking to friends online all over the world. Now with it becoming the Messages application I was curious to see if it did more than what you see at first glance. Reviewing Take Control of Messages in Mountain Lion gave me the chance to delve a little deeper into Messages. I was familiar with the iMessage Application on iOS, having used it since its introduction, but Messages is different. There’s more to it than simply iMessaging, and happily this book is very helpful and useful to both longtime users of iChat or to those who have just started using it since it became Messages. For longtime iChat users Take Control of Messages in Mountain Lion covers the changes that have occurred within the Messages application as compared to when it was the iChat application. For those new to the Messages application, this book makes using Messages a lot easier with easy to follow guides and instructions for using all the various clients that are available in the application, such as Google Talk, AIM, and Yahoo Messenger. The Take Control bookalso touches upon the etiquette involved in using such services which I found most interesting. I do believe this to be of value because not everybody is aware of such things when using such an application. Also, it makes you think about how you might want use the Messages to be contacted and how you don’t want to be contacted. There are also many other hints and tips as well as extras that you can access on the Take Control website through a link in the book. You must have a Take Control account or create one which you can do through the link in the book to view them. 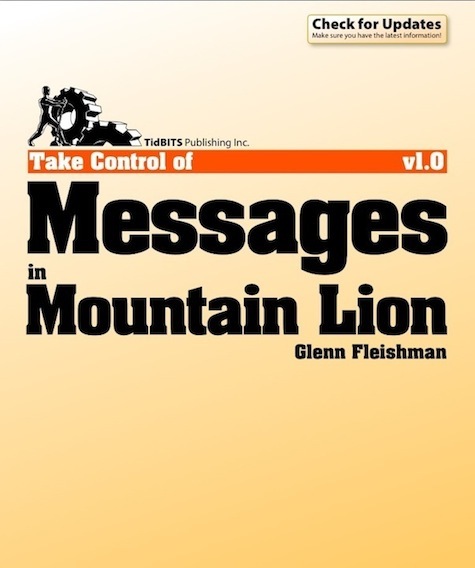 I would highly recommend this book to everyone who uses the Messages application whether you’re an experienced user or new.